Each Jason cap includes an interior dome light, tinted safety glass, easy-lift gas door struts, a third brake light, a locking rear door, and an integrated fiberglass base rail system. All are back by Jason's limited lifetime structure and paint warranties. Jason truck caps add security, great looks and value to your truck. The Cyber features rounded curves with a skirted / wrap-over-the-rail design highlighting the trucks styling. 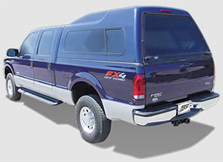 Recessed side windows, doors and LED brake light conform to your truck, enhancing the trucks total look. Side windows have a rear crank-out vent with screens. The all glass rear door features curved styling with a rotary latch / lock system with a push button release. The Extreme features an advanced design frameless - all glass - rear door, coupled with side recessed, curved all glass windows which includes rear crank-out vents with screens. The Zone has unique features bring together three key components – styling, value and versatility. With custom fits, the Zone looks right on your truck. The handsome all-glass rear door with Jason’s exclusive oval twist handle moves the Zone to a different level. High roof / above cab design provides more tailgate entry space and headroom for larger loads. This is the primary feature the Trek series offers. Note that the roof line slopes higher behind the cab increasing available cargo area. Sleek – Streamline – Sporty - Affordable….. all describe the value built into every Jason Pace Cab High.The Pace’s efficient good looks, reasonable price, limited lifetime warranty, and road-proven performance make it a great choice. Copyright © 2012 Finishing Touch Car & Truck Inc. All Rights Reserved.